I love my job. It is what drives me to learn more, work harder, and be…more. I’m a runner, and it gives me the steam to power through hard runs. It helps me set a good example for young people. It humbles me to know that I can think I have accomplished so much but still know that I will be met with new, challenging students each year. Even though I have been teaching for years, I learn and grow so much with each new group of students. I can look at my son and say with pride that I am a teacher, because while not everyone appreciates teachers as they should, I know that my students feel better about what they do and who they are because of what they accomplish with me. I have taught in some very challenging situations. The first school I taught at a school had no resources, a high drop-out rate, and frequent (often daily) violent outbursts. My students often didn’t do homework, had no materials in class, and sometimes saw no value in what I was teaching. I thought I would go in with great ideas and they would want to learn, but this just wasn’t true. At first, I didn’t have great ideas. We didn’t have a curriculum, my textbooks were ancient, and I didn’t even have a board to write on. I had no idea what to teach or how to teach it. I was not a certified teacher. But…I was determined to do my best, so that’s what I did. Here are some things I learned quickly, and although I no longer teach in that school, they are strategies that I apply today because they work so well. I have my certification and many other professional development workshops under my belt, but the survival mode I taught in for my first four years has formed what actually works in my class. Okay, I know that sounds simple, and of course we know that learning should be fun. However, in my first school, I had to be fun and interesting or they just would not be motivated. I’m not saying every day is a game. I can be quite boring sometimes, and I’m sure my students would tell you that. Face it, verb conjugation lessons aren’t amazingly interesting, but the practice games can be really fun! Read this to find some fun ways to practice verbs! One cheap way to have fun practicing vocabulary and verbs is to get student dry-erase boards and practice your questions this way. Even high-schoolers still love the feel of writing with markers. If you don’t have your own student boards, you can buy a set at most-teacher supply stores or make your own! To make your own: Go to the hardware store and find white panel-board. It comes in a large board, but most large stores will cut it for you in 12″ X 12″ or 12″ X 16″ for a few dollars extra. Total cost for 24 boards is about $15. 2. Be sure to say hello to every student every day. I mess up a lot. I can’t draw. I’m clumsy and am known to throw markers across the room (totally on accident, but I talk with my hands a lot). I could be worried that I look dumb in front of my students, but I know that if I laugh it off, they will have fun and remember what we did in my class. We have fun in my class, and because I am not so serious about silly things, I can be serious about discipline. They know when to have fun and when to work. 4. Be strict but be fair. Yes, in a difficult school, you can be strict! You must be strict. I know how hard it is when kids come in late (even 5-10 minutes) with no pass and no excuse. It is even harder when colleagues are worn down and don’t follow school procedures. I know how annoying it is to hear, “We get to do that in so-and-so’s class” and know that this is true. Stick to your rules. Make your expectations clear and stick to them. Students will rise to your expectations if you expect them to. If you have a rule, it needs to be the same for everyone. Look seriously at how you treat students. Have a trusted colleague come in and evaluate you on this. Do you call on boys more than girls? Are students getting enough time to think? Do you address all students with respect? Are there exceptions for some students or do turn your head when a certain student breaks a rule? This is hard to see in ourselves, and it is really worth it to ask someone to observe you. When I asked for help, I found that I called on boys more than girls because they had their hands up more. I also tended to call on the same students a lot. Having the data there to look at helped me change my teaching to be more fair for all students. 5. Be someone they connect with. When I started teaching, I looked so young that I had to tell the lunch workers not to charge me for a student lunch when I went to the cafeteria. Nevertheless, my students thought I was pretty old. I had to work hard to make connections with my teenagers, because to them, I was another old lady telling them what to do. I sought out ways to get to know them so I could make connections and build trust. You can do this, too, in just a few minutes a day. I use a lot of exit tickets, and they aren’t just for assessing class material. I check in with students and give them time to communicate their needs. They might not tell you face-to-face, but I bet a lot of them would write it down if asked. I usually only ask 1-2 questions at a time so they have time to really think. Some kids will be hesitant, but you’d be surprised how many will be very honest. 1. What is one thing you wish I knew about you? 2. How do you feel class is going lately? Why? 3. Is there anything going on at home that is making it difficult to keep up? 4. Are you having any issues with others at school that are distracting you? 5. What is something you’ve done lately that you are proud of? 6. Are you getting the help you need from me? 7. What is the most fun thing you’ve done in the past month? 8. What is something that frustrates you? 9. What is something that made you laugh recently? 10. What is something you are excited about? Grab some FREE French exit tickets here or get FREE English exit tickets here. I’m not saying that students should get to do whatever works best for them. However, there are moments to speak individually with a student and make exceptions for late homework. For example, if you have a student who you know is a care-taker at home and he/she is struggling to do the work, you can set a contract with the student that he/she does the necessary work by certain due dates, and you can be flexible. This is fair, because this student might not succeed without some leniency, and the problems at home could become too much for the student, leading him/her to drop out. Make sure that you make procedures known and that you stick to them. If your students know that they enter your room and start bellwork everyday, then do that EVERYDAY. Don’t change up your procedures, because when kids don’t know what to do, they misbehave. 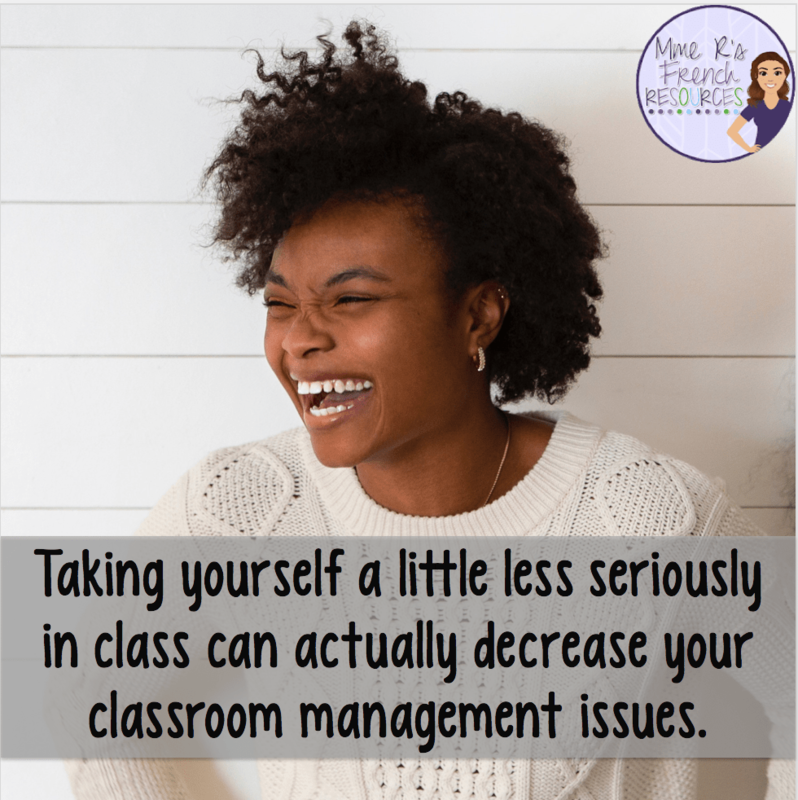 I can remember the moment when I realized I actually had good classroom management. One day during passing period, I received a phone call. In retrospect, I shouldn’t have answered it, but I did. While I was on the phone, the students came in, sat down, and began working on bellwork. The bell rang, I was still on the phone, and they continued to work in silence. I was amazed! They did what I expected and I didn’t even tell them! So, the next day, I brought them all in a small treat for doing such a great job. Yes, it is expected, but a little appreciation never hurts, either. I sit my students in groups of 4, and for each month, I choose a student to be responsible for his/her table. Students love this, because some students NEVER get picked to be responsible for anything. They all want to shine, whether they show it or not. The responsible student must collect and turn in homework, pass out dictionaries, and do any other necessary tasks for their group. This is established at the beginning of the year, and while the students change during the year, the procedure does not. Another benefit of this process? Less time spent explaining procedures during the lesson equals more time doing, and your students will appreciate the routine. Don’t be afraid to admit you don’t know something, that you didn’t have time to grade their papers, or that you really messed up a lesson. I know a lot of teachers (myself included) who didn’t want to seem like they didn’t know what they were doing, so they were defensive of their mistakes and didn’t improve. That is just silly! It isn’t about us. It is about doing the best job possible for the kids, and if that means that I admit that I don’t know something or that I need their input on how to improve a lesson, I’m all for it! Need a free way to get input? Click HERE to download a FREE teacher grade card! This is the most important! Some of the most difficult students have home lives that we cannot even begin to imagine. I have heard stories that sent me home crying at night, but those stories inspired me to try harder. When I realized that the small birthday treat that I gave a student was the only thing she got all year, it made me try even harder to do something special for all students when I could. Are you a new teacher struggling in your classroom? Read this to discover what I wish I’d known during my first year teaching. What a great post! I agree whole-hardheartedly with all of these! Great ideas! It does take a lot of work to implement these consistently but the rewards are so worth it for both the teacher and the students. It will never all be perfect but I think as long as we keep trying, learning and growing then that's achievement. Thank you! 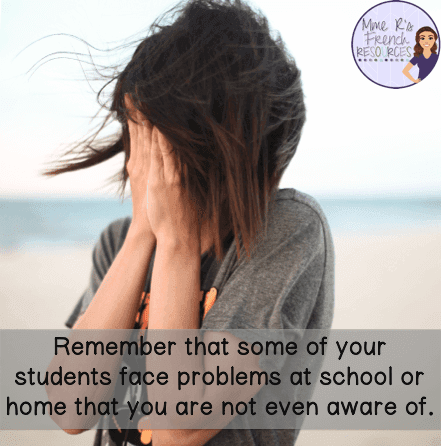 These tips can work for all grade levels…I feel so strongly about greeting each child at the door and to be fun, but also know when the fun is over then it is time to settle in and be a little more serious. As you stated be fun…be serious!! I also agree with consistency…it is so important! Great post. Thanks for sharing! As a parent of teens, these are great reminders and ideas!